A renowned North Bengal Medica Cancer Hospital (NBMCH) Rangapani, Siliguri makes a triumphant success story viz medical boon for people of all walks of life. 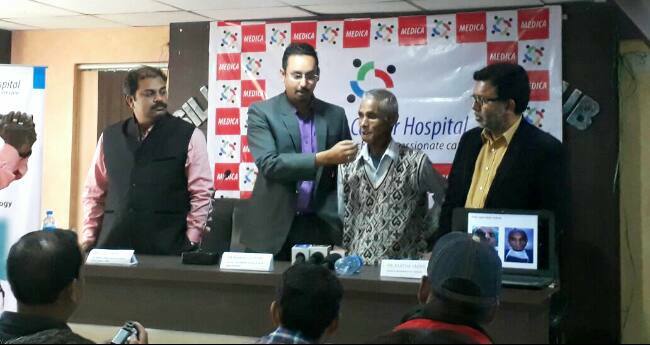 The experienced medical team of NBMCH take a challange for the first time with full determination and spirit to give a new life to an ailing cancer ridden person of Sikkim. The challange was complicated though the tendency to get it over and bring smile on ailing patient was the team's ultimate goal. The cancer surgery and micro vascular reconstruction started off in an inhouse NBMCH Oncology Center Operation Theater with all life supporting medical equipments, gadgets, applying latest & modern surgical techniques that which lasted for all most 11 hours. Mission was to reconstruct the lower jaw (Mandible) and the lower lip by the Cancer Surgeons and Plastic Surgeons. Using the modern "Microvascular Techniques", the reconstruction was done for skin flap makeover and using leg bone (fibula). The sweating mission accomplished with galore and the patient after recovery was discharged back home to Sikkim happily. No doubt the life is important, brining a smile back to ailing patient with a new life after prolonged illness & suffering is even more important. That all was seen right here in this major achievement done by NBMCH. Interesting thing is that the cost of entire surgery unto discharging patient happily took just a half compared to what other similar hospitals across major cities in metros pegs for. Hats off to the entire medical team of North Bengal Medica Cancer Hospital, Rangapani for the great medica-socio-ability and world wish to see more such smiles in coming time all due to your pioneering humanly service , medical advancements and hospitality. Surgery of head and neck cancer is not just removal of the cancer affected area. Reconstruction of the excised area is equally important to restore function and cosmetics to improve the quality of life. First time in North Bengal, in Medica Cancer hospital, Rangapani, a team of cancer surgeon and plastic surgeons successfully recreated the lower jaw (mandible) and the lower lip of a patient by most modern surgical technique. After removal of the lower jaw and the lower lip by the cancer surgeon, the area has been reconstructed by using leg bone (fibula) and associated skin flap by MICROVASCULAR TECHNIQUE by the reconstructive team. The surgery took about 11 hours and the patient has been discharged home in favorable condition. Importantly the cost of the surgery is half of what it would have cost in most major cities.